I made butter! How brilliant is that? You can get some cream… and turn it into butter. In your house. It’s like magic! Why would you bother making your own butter? Well, firstly because you know what goes into it – it’s great lesson on how our food happens (kids LOVE making butter). And secondly, because it’s fun to make stuff. Making butter gives me cooking joy! Butter! I gather that double cream is not widely available in the US/other foreign parts so if you are there get the cream with the highest butterfat you can. Double cream has a 48% butterfat content and the closest in the US seems to be heavy or whipping cream, which is 30-40% butterfat. If you want to add salt, you can. However much you like. Mix it in after the buttermilk and fat have separated but before you squeeze and pat it. “Cooking” is a bit of a misnomer. All you need to do is pour the cream into a container that you can seal tight = a (clean) jam jar, or bottle, or tupperware. And then shake it. For AGES. At first it’ll slosh about, and then it’ll get thicker and seem like it’s not doing anything (but it is). Persevere – it should take anything from 10 minutes to three quarters of an hour. Shake it, shake it, shake it like a polaroid picture. Shake it above your head, shake it down by your knees, roll it along the ground, work those triceps. Eventually, suddenly, you’ll hear a slosh. The fat and the buttermilk has separated. Hurrah! Now you need to rid the fat of all the buttermilk. Drain the liquid off (but keep it, it’s useful for making other things) and then rinse the butter throughly. Keep rinsing until the water runs completely clear, and then squeeze the butter. I just squeezed the butter in my hands, but you could use some muslin or cheesecloth, which would be less messy. More buttermilk will come out and it’s important to get it all out because if there’s any left in it can cause the butter to go rancid. Use the back of a wooden spoon or spatula to shape and pat the butter, draining any more of the liquid that comes out in the process. Wrap it in grease-proof paper and ta-dah! 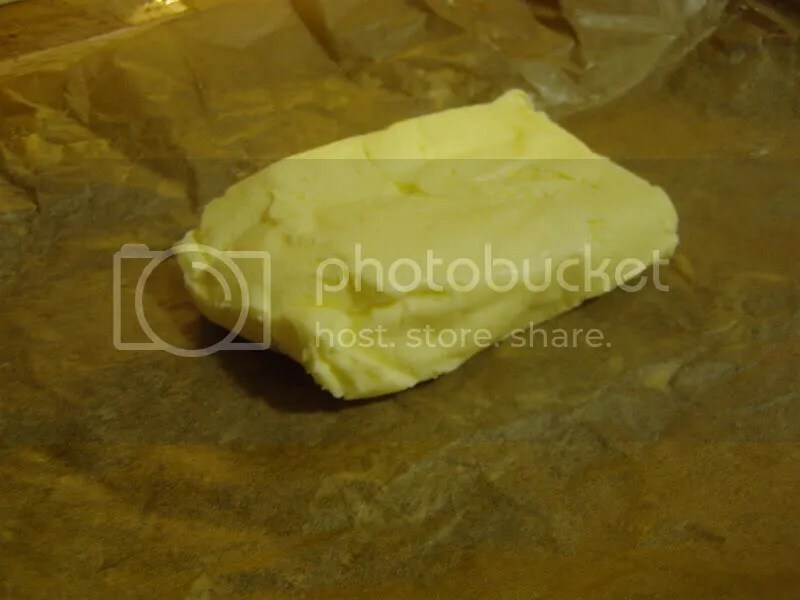 Home-made butter! Butter! I once put some cream in to my icecream maker, forgetting that I was supposed to freeze it first(!) and I think it started turning into butter. I meant to try it again but I never got round to it. I am definitely going to try this recipe of yours. what else can you use the liquid for? Well, you know… Anyplace you’d use milk. In a nice curry, or in pancakes, or biscuits. Anything. If you make butter from ‘cultured’ cream, the ‘buttermilk’ has a rich taste, like yogurt. I like doing this with a stand mixer… Doing it by actually shaking it seems pretty extreme to me (almost an hour of shaking?! How to you sustain the will to finish?). baked bread made in an old coal stove was fantastic. So get out there and shake your first efford first. it is so much more appreciated. You can use buttermilk for making Soda Bread. you can use buttermilk to make a special drink which is very soothing, and very energizing. add sm salt , some curry and a crushed green chilly into the butter milk and shake it well.. voila you have a healthy, creamy drink.. This buttermilk drink you’ve posted sounds like something we’d like. So, say to a glass of milk, how much curry powder? and salt? I only know how to cut chillies how does one crush them? Does the chilli have a certain name? I don’t want to get a boiling hot one and burn us both. you can use buttermilk to make a special drink which is very soothing, and very energizing. add sm salt , some curry leaves and a crushed green chilly into the butter milk and shake it well.. voila you have a healthy, creamy drink.. If you leave the cream to come to room temperature first, it turns into butter in less than 10minutes! I really need to get the lil one making butter! Buttermilk gives an extra rich flavour to scones substituting it for the milk.